Reviewing a book written by your mother is not an easy task. Do I refer to her as "my mother" or "Leadbeater" or "the author"? Do I tell the truth about how little I cared for protest marches as a young child in the 80s? In the end I think I worked through these issues reasonably well, but it still feels a bit weird. This review is a response to a request from the ISO for a review article for their magazine. He looked puzzled and even pained for a moment. Then a kind of ecstasy dawned on him. Like Zorba the Greek he began a dance, half of defiance, half of joy, on the very nose of the incoming sub, a nose by this time streaming with yellow radiation – colour paint. For me reading this book it is impossible not to reflect on my personal connection to these profound and exciting protests. It feels quite strange to refer to the author as “the author” when she is in fact my mother. It is also an odd feeling to read about the action packed, adventurous deeds of protestors such as Stephen Sherie. From my point of view at the time, there was nothing quite as painful and boring as a protest march. Alongside the endless telephone calls and meetings, and long visits to activist centres such as Epicentre, my childhood memories are at odds with the adult perspective of my mother. I can still remember vividly the feeling of pain and resentment caused by her insistence on watching the six o'clock news. I was much more interested in The Dukes of Hazard on the other channel. I hated being dragged along to protest marches, I would much rather ride on my bike or play with my lego blocks. Looking back on the 1980s as an adult, I think that the brave actions of people of people such as Sherie and others in the peace movement are far more inspiring and meaningful than the fictional heroics described by TV shows like The Dukes of Hazard or The A Team. Alongside the action packed anti Springbok protests of 1981, real life activism in New Zealand in the 1980s beats Hollywood fantasy hands down. I recently talked to my mother about the incredible diversity of the 1980s peace movement. Some of the activists were radicals who would have participated in the anti Vietnam war protests of the 1970s. Some of the people involved would have been more motivated by watching the 1984 movieThe Day After, or listening to the popular international speaker Dr. Helen Caldicott. Other groups wanted to link the anti nuclear struggle with related issues such as Maori sovereignty and pacific anti colonialism. Were there fights and arguments between the different groups? Overall, co-operation and the uniting force of a common cause against nuclear weapons won out against the divisions within the movement. The Campaign for Nuclear Disarmament (CND) acted as a co-ordinating force, and internal differences were never a major issue. From my mother's point of view one of the strengths of the movement was its decentralised nature. People from all sorts of different political backgrounds could unite behind the banner of the anti nuclear cause quite easily. There was an underlying positive and ethical stance against the inhuman horror of nuclear war which functioned as a unifying force. While many New Zealanders may have agreed with a conservative pro ANZUS position advocated by people like Robert Muldoon, they never came close to attracting any sort of passionate political following. I think it is interesting to compare the cultural impact of the 1981 Springbok tour to the anti-nuclear protests of the same period. While both were divisive issues, the anti-nuclear movement attracted none of the bitterness or anger which the tour protests provoked. This fact surely says something about widely shared values and interests within the country as a whole. Rugby is prima facie an innocent sport, whereas nuclear weapons are by their very nature the exact opposite of innocence. Having said that, there is a fascinating discussion of the most significant source of tension within the movement: the issue of Maori sovereignty. This discussion is put into the historical context of events such as the Bastion Point occupation, the broader Maori land rights movement, and also the pacific struggles for independence in places such as Tahiti and Kanaky. It is in these sections of the book you will learn things which you would not otherwise by reading newspapers or more mainstream historical accounts. Activists themselves get to tell the story, as both participants and commentators. Other chapters detail a wide range of interwoven issues and historical episodes. These include both well known incidents such as the Rainbow Warrior bombing, and the more obscure (yet equally fascinating) efforts of determined peace researchers such as Owen Wilkes. Diligent research uncovered the existence of places like Black Birch: a remote observatory near Blenheim, which gathered stellar observations to assist with the accuracy of US missiles. These sorts of intelligence gathering operations rarely gained any significant mainstream exposure, but they help us understand the nature of the military links NZ has to superpowers like the US. With the ongoing saga of the surveillance issue, and New Zealand's complicity with organisations like the NSA, these accounts of “intelligence activism” have a lot of contemporary resonance. The analysis of the events of 1987 is quite fascinating. 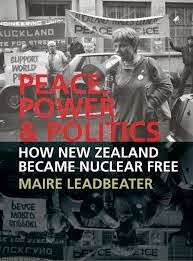 The peace movement could finally celebrate a victory, as The New Zealand Nuclear Free Zone, Disarmament and Arms Control Act became law on 8 June 1987. This triumph is however put into the context of the concurrent triumph of neo liberalism, with the Labour government implementing a swathe of extreme economic reforms directly opposed to the interests of it supposed constituency. Somewhat cynically, the Labour party actually leaned upon the moral credit it had garnered from the anti nuclear legislation to help it return to power again the same year. There is a definite positive legacy here: even National was eventually pressured into adopting the anti nuclear stance as its own. But the broader goals and values of the peace movement, such as the commitment to social justice and fairness, were undoubtably betrayed by the cruelty of Rogernomics. Another highly significant event from 1987 was the military coup in Fiji. The democratically elected government led by Timoci Bavadra was committed to the establishment of a nuclear free zone in the pacific. Not long afterwards, the military staged a coup and installed Colonel Sitiveni Rabuka as Fiji's new leader. There is clear evidence of US involvement in the lead up to the coup, if not the coup itself. The author quotes an unnamed Pentagon source as bragging “[W]e're kinda delighted … All of a sudden our ships couldn't go to Fiji, and now all of a sudden they can ...”. Again, the broader principles of the peace movement are betrayed by the Labour government, who accommodate Rabuka without losing too much sleep. The issues here are complex however, and Leadbeater describes how the Fiji coup actually divided many activists. The final chapters which detail the peace movement campaigns of the 1990s are also insightful. Although the mass movement of the anti nuclear protests of the 1980s was no longer present in such huge numbers, the actual issues were no less important or consequential. There are chapters on Waihopai, the 1991 Gulf War, the 1993 'Peace Power and Politics Conference', Bougainville, the World Court Project and the 1995 Moruroa campaign. Although Peace Power & Politics is largely an inspiring and optimistic book, it raises questions for the present day which are difficult and complex. In 2014 the face of US imperialism has changed its appearance. Nuclear warships no longer visit our shores, but New Zealanders are killed by drone strikes thousands of miles away in Yemen. The cold war is over, and ANZUS is apparently history. Yet the Key government co-operates closely with its Five Eyes partners, and the Waihopai spy base continues to support the murky and secretive activites of the GCSB and the NSA. As my mother notes in the conclusion, New Zealand resumed full intelligence relations with the US in 2009. We co-operated with the so called “War on terror” in Iraq and Afghanistan, and continue naval “RIMPAC” exercises with the US. While there are many activists and ordinary people who oppose these sorts of activities, I think it is fair to say that the overall ideological situation is quite different today than what it was in the 1980s. Although we did not send actual combat troops to support the US invasion of Iraq, and there was a passionate protest movement against this illegal war, this was not anywhere near the scale of the anti nuclear protests of the early 1980s. The recent drone assasination of a New Zealander in Yemen attracted some debate, but John Key did not blink as he confidently shrugged off any suggestion of raising the issue of drone strikes with President Obama. The fact that this sort of issue will not be a major influence on the election demonstrates the amazing power of fear and suggestion: the threat of terrorism, whether real or manufactured, prevents us from seeing the underlying reality. Even the Snowden revelations and the associated GCSB scandal do not seem to come close to providing the basis for a mass movement such as the 1980s peace movement. The image of a mushroom cloud, and the nightmare scenario of a nuclear winter, seem to be more clear and potent mass motivators. The insidious idea that spying is necessary – again, thanks to the ever present threat of terror – this idea creeps around like a cockroach, unable to be killed, even by a nuclear war. Another aspect of this “post political” ideological climate is the change in character of the presentation of power. The Cold War has been won by the victorious forces of Freedom, and war between the major Western powers is (apparently) no longer a possibility. War is something that happens only in the barbarian margins of civilisation: poor countries in Africa, or places in the Middle East dominated by the evil backwardness of Islam. The face of this liberal utopia is a smiling one: who can possibly doubt the obvious fact that Barack Obama is a Nice Guy? The fact that he is black just makes him more liberal. Our own John Key succeeded partly by abandoning the racist rhetoric of Don Brash and entering into a relationship with the Maori party. Cynical as we might be about his actual motives, the resulting picture is convincingly teflon coated. We, The New Zealand People, are One. There might be a few dissenting voices here or there, but these conflicts will be worked out over time. Compared to Muldoon, John Key is an enlightened metropolitan sophisticate. It is hard to imagine Muldoon turning up to a Big Gay Out celebration, just as it is unlikely that Key would ever let himself appear drunk in public. Again, compared to Ronald Reagan, Obama is a paragon of tolerance and integrity. These are almost unimpeachable images, the result of armies of PR consultants, media advisors and countless thousands of dollars. There is an underlying continuity linking the neo liberal turn of the late 1970s and 1980s to the world of today. But it seems to me that even though the harshness of the neo-liberal economic paradigm lives on, somehow our current day rulers appear as gentler and more sensitive than their counterparts from the 1980s. I don't believe that the current geo political situation is stable, and I do not believe that the neo liberal economic dogma followed by the major Western powers is conducive to peace and harmony between peoples and nations. So I think that more and more cracks will appear in the perfect images of complacent power. Somehow, mass movements challenging the status quo will need to be built again. These will have to be of a different character to that of the anti-nuclear movement, to be able to match and counter the sophisticated “manufacture of consent” methods of the current ruling class. Nevertheless, there will also be continuities and similarities, so the history contained in Peace Power & Politics provides us with both information and ammunition.